Before getting started, there are a few things fabricators should consider before welding inconel. Why? The material is expensive to replace, unforgiving to mistakes, and incredibly difficult to work with. If you don’t have a clear idea of these three things, you won’t be able to create a high-quality product for the customer. What is the Purpose of the Part? Before you get started on any inconel project, you have to work closely with the customer to understand what the purpose of the part is. At ATWF, we ask as many questions as possible, and even try to set up an on-site demo at our customer’s facility so we can see exactly how the manufactured parts and inconel welds are being used. A firm understanding of the process of the part can help the ATWF team in design and process creation to understand what needs to be done, and what can be improved. Asking pointed questions to the customer about the product can reveal opportunities for improvements. What Process Has Been Used in the Past? Determining how the product has been manufactured in the past can lend a hand in designing a process that will improve the quality of the new end product. While getting in touch with the previous manufacturer is likely not an option, a close inspection of the part can yield illuminating facts. Have the inconel welded joints passed a pressure and penetrative test? Has the inconel welded product lasted as long as the customer expected? Was the correct inconel rod used for welding the material together? Are the welds done correctly with the proper level of penetration? Asking these questions during a product inspection can reveal best practices for moving forward and offer insights for improving the product. How Can the Part Be Improved? Which brings us to the final thing to consider before welding inconel: how can the part be improved? While it may be easy to see how the inconel product doesn’t come up to snuff, determining how to improve the piece can be a bit more tricky. A small piece of inconel, just 1/8” thick measuring 16 ½ x 32” can cost just under $800. That’s before the piece is shaped, manipulated, or welded. Making a mistake can be expensive. And that’s where experience and skill working with this kind of material is a huge asset. At ATWF, our team has worked with inconel on many projects. We understand how it works, how it doesn’t work, and how to deal with it appropriately, but a less experienced company could have severe financial troubles just from learning the ropes on a new project. 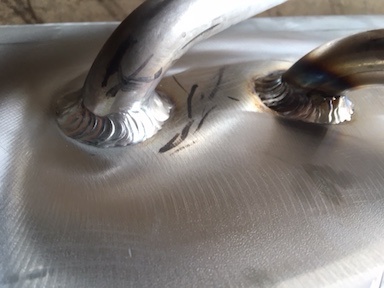 For new inconel welding projects, the team at ATWF tests out several processes small-scale and then uses testing and replication to ensure quality for future applications. As we’ve gained experience welding inconel and using varied applications, we’ve seen what does and doesn’t work. Use our experience and expertise to keep costs low on your next inconel welding project. Contact our team now for a quote or consultation.